You may recall a video from earlier this year by Russian YouTube channel Garage 54 ENG. In it, Vlad, the host, throws 38 inch off-road tires on his VAZ 2106 sedan and rips donuts. Well, now an American has decided to replicate this stunt, but with slightly smaller tires on a vehicle fairly common in the U.S.: a sixth-gen Honda Accord. 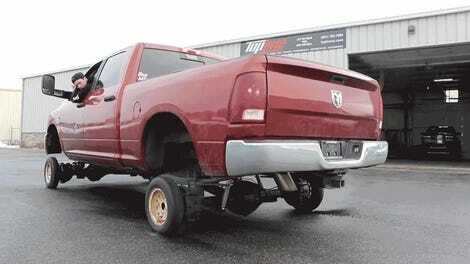 Those wheels may look familiar, because they came off of Bug bmx’s huge heavy-duty Cummins-powered Ram, which the host slapped tiny wheels onto as shown in a video that we shared last week. The big meats look good on the Accord, and, despite probably hurting the turning radius a bit, help the sedan jump over snow mounds and curbs—or in other words, they’ve given the vehicle the capability to do as much “off-roading” (also called “mall crawling”) as 99 percent of jacked-up pickups in America.